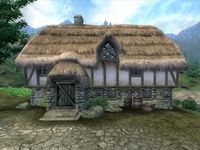 The Wawnet Inn is an inn in Weye, just west of the Imperial City (quest-related). The publican, Nerussa, buys potions and food while only selling the latter. The ground floor contains the main reception area consisting of a bar with a counter and a dining room. On a lower level are Nerussa's bed and chest while the rooms are upstairs. Wawnet Inn is one of the few buildings that has an inaccuracy regarding the windows on the building. The front of the inn shows a few larger windows on the top floor. However, within the rooms for rent there are many more windows on the inside than there actually are on the outside. Nerussa is one of the few leveled merchants in the game, causing her to gain 1.5 points of Mercantile skill each time her level increases. Therefore, her Mercantile skill at any point in the game will be 30+(PC-1)*1.5. Esta página foi modificada pela última vez à(s) 16h19min de 9 de agosto de 2013.